Politicians relying on slush funds to run their campaigns will not have it easy, The Nation has learnt. Detectives are off to Ghana to block repatriation of such funds. The mission to Ghana is headed by Economic and Financial Crimes Commission (EFCC) Acting Chairman Ibrahim Magu. The anti-graft agency is also hunting for properties bought with illicit cash by some Politically Exposed Persons (PEPs) in Ghana and other West African countries. The EFCC has signed a Memorandum of Understanding (MoU) with the Economic and Organised Crime Office (EOCO), Ghana Financial Intelligence Centre (FIC) and Ghana Police Service (GPS) to track down some suspects. Magu and the detectives arrived in Ghana on Sunday night with some intelligence report on huge campaign cash movement along the West Coast and a list of suspects being trailed. It was gathered that in the last 72 hours, the EFCC delegation and the team from the EOCO of Ghana have exchanged some information. A source, who spoke in confidence, said: â€œThe EFCC chairman has taken the battle against the use of slush funds for campaign by candidates to Ghana and some ECOWAS countries. â€œDue to cash crunch, there have been intelligence reports that some politicians and those who looted the treasury had been trying to haul cash to Nigeria for campaign. â€œSome of them were suspected to be engaging some Nigerian banks in Ghana for the transfer of the illicit funds. Another source gave insights into the Ghana trip. The source said: â€œThe Commission has been targeting safe havens all over the world through collaboration with law enforcement agencies in those countries. The commission is making tremendous progress in recoveries of funds and properties from such territories and within Nigeria. â€œThere is high rate of movement of these funds by road transportation through the porous land borders to avoid the prying eyes of security personnel at the airports. â€œ Maguâ€™s fear is that if these illicit funds are not checked, they could be used to undermine national security. â€œThere are suspicions that these funds could be used to support Boko Haram terrorists as in the recent dare-devil audacity with which the group has been challenging the military. The EFCC team is also in Ghana to identify properties and explore areas of cooperation with the Economic and Organized Crime Office (EOCO) and other agencies. A third source said: â€Some PEPs and cybercrime fraudsters in concert with some Ghanaians and financial institutions buy choice properties running into millions of dollars in protected neighbourhoods in Accra. â€œThere is also the angle of crude oil thieves who smuggle products from Nigeria, using Ghana as their base and thereafter laundering their proceeds through buying properties or moving the monies to Nigeria. â€œMagu is working in collaboration with the EOCO, FIC and other relevant law enforcement agencies in Ghana. 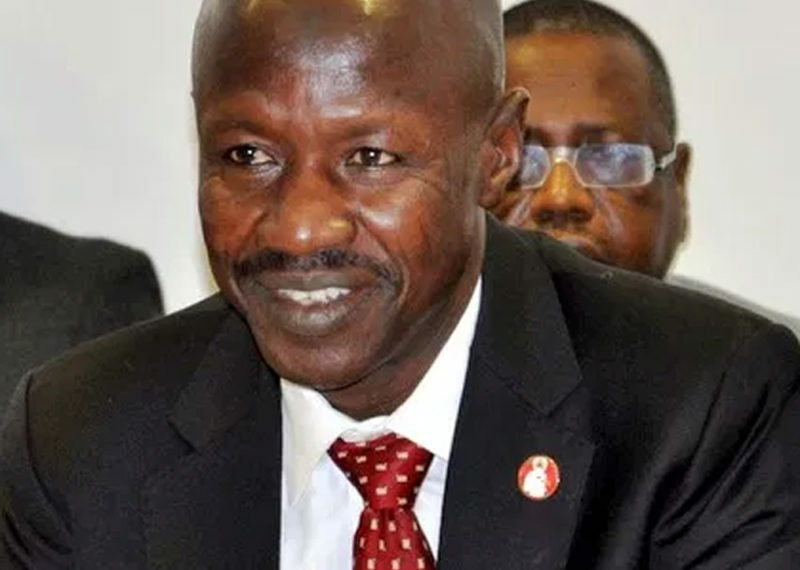 When contacted, the Special Assistant on Media and Publicity to the EFCC Chairman, Mr. Tony Amokeodo, confirmed that a team led by Magu was in Ghana.